Linebacker who was a 7th round pick of the Seattle Seahawks in 2011. He became one of the team's defensive leaders and was named MVP of Super Bowl XLVIII after recording 10 tackles and returning an interception for a touchdown in Seattle's 43-8 blowout win over the Denver Broncos. In 2015, he signed with the Oakland Raiders. He played college football at USC under Pete Carroll, who would later draft him and coach him on the Seahawks. He became the first defensive player to win Super Bowl MVP since safety Dexter Jackson won the award for the Tampa Bay Buccaneers 11 years earlier in Super Bowl XXXVII. 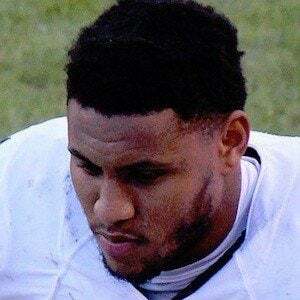 His older brother Steve Smith played wide receiver at USC and then went on to play for the New York Giants, Philadelphia Eagles, and St. Louis Rams in the NFL. Behind Smith and cornerback Richard Sherman, the Seahawks constructed one of the NFL's top defensive units in 2013, leading to the franchise's first ever Super Bowl championship on February 2, 2014.